This blog was my idea, Daphne Chliverou Jaeggi. I am Dutch and have been living on Skopelos since 1996. I am married to Jannis who was born on Skopelos. He is a carpenter and we have two children. 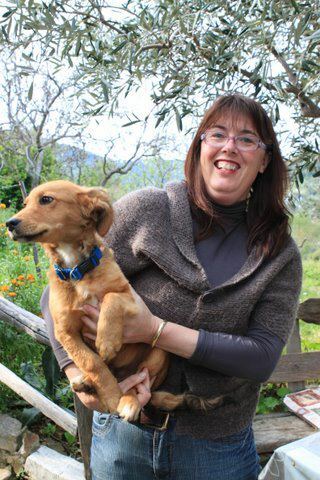 I am a librarian but I have been working in a real estate office based in Skopelos town the last 12 years. Before that I worked in tourism on Skopelos for about 10 years. This 1st job brought me to many places on the island and that is how I got interested in all aspects that make Skopelos such a special place. I also made contact with many different people and nationalities. I started the blog in January 2011. I always wanted to write about Skopelos but when I was asked to stand for council member in November 2010 I heard from many people that information about what is going on Skopelos, is very difficult to acquire. Most of the announcements are in Greek and written on posters and pieces of paper glued on walls of buildings. I thought that via the blog anybody that is interested in “news” could read it. And so I started. I have written the blog for many years with two co-writers. At the moment I write the blog by myself. I write what I like, what I love about living in Greece on a small island and what I think you should know about Skopelos. I am not trying to be complete. I write because I enjoy it. The blog is for everybody on or off the island. We recently did Athens to volos by rail and your blog was a great help thank you, keep up the good work! Thanks Athanasius for you kind words. We love making the blog and showing people what we love about it. I am also from the Sampson family. Here in the USA (Tampa, FL) my great-great grandfathers grave says he was born in Skopelos in 1859. He, Afthemious Sampson, had a son named Mitchell that was born in Savannah, Georgia in 1890ish. I believe he was an only child though. He was married to Athena Kilberis(?). I’ve had a hard time tracing Afthemious and Athena. I wasn’t sure Sampson was an actual Greek surname or shortened when immigrated. I am on ancestry.com at tlcfishback. Keep up the good work! What a great source of info! Congratulations Daphne, I looked all the winter at your blog, It is like a piece of sun in the grey Parisian winter. Makes us very impatient to be back at the beginning of June. Some informations about the temperature would be nice too. Have been meaning to contact you to say how much we enjoy your Skopelos Blog, which we have read with much interest throughout the winter, especially since we were caught up in the devastation on that terrible night in September 2015. (We were actually in the same venue as Daphne and her family). We love Greece and have visited many islands but Skopelos is special. We have visited many times over the years, always staying in the Town. Our next trip is planned for mid September, we are both really looking forward to this visit to catching up with all the people we have met over the years and to show our appreciation for how the community has been so determined in their plight to reinstate this beautiful island . an e-mail to the above address bounced back. I am a friend of John Gill’s and wanted to thank you for arranging matters for the funeral. Is there a current e-mail for you as I have some information and questions for you? Thank you so much. Hi Debbie, I am glad you liked my town walk so long ago. I loved doing the walk and maybe in the future when I am much older (haha) I will take it up again. Not for now unfortunately. I am too busy. Sorry !